Stories of civilians who lived through the War of 1812 will be turned into a giant art installation for Luminato. Fort York during The Encampment. Digital rendering by Thom Sokoloski. 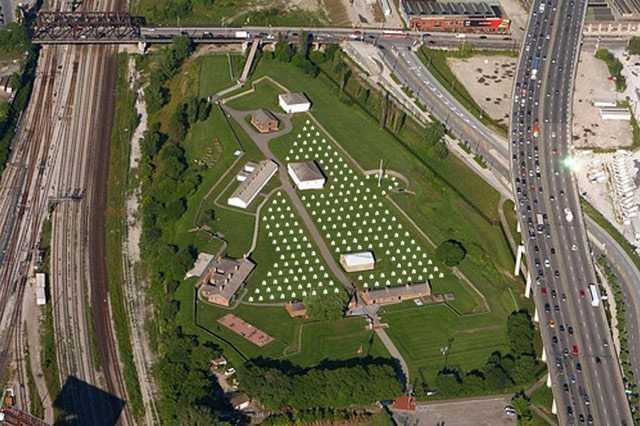 Later this spring, a new tent city will make its home in Toronto. But unlike the Occupy Toronto protest in St. James Park last year, this encampment will have nothing to do with changing the present, and everything to do with celebrating the past. It will help kick off the city’s commemoration of the War of 1812 Bicentennial. Image from 2006's Confinement of the Intellect. Photo by Ryan Mallard. The artists hope their civilian collaborators will research their chosen stories as if they were conducting archeological digs. During a preview for prospective participants at Fort York yesterday, Sokoloski suggested that collaborators could look for items emblematic of the tale they are telling. As one example, he suggested that if a shoelace was important in the life of a person who lived at Queen and Jarvis, the participant could scour that area for a shoelace to display. Starting in April, participants will attend a series of workshops, during which they’ll design the installations with guidance from the artists, who are suggesting that the displays incorporate sensory elements like sound or taste. Despite these general guidelines, Sokoloski admitted that “we have no idea how it’s all going to end up.” He compared the tents to individual stage shows: the tent flaps will be closed until each visitor comes in to experience his or her own opening curtain. The only lighting will be provided by lanterns; in the artists’ past installations, this has led to interesting presentation tricks. 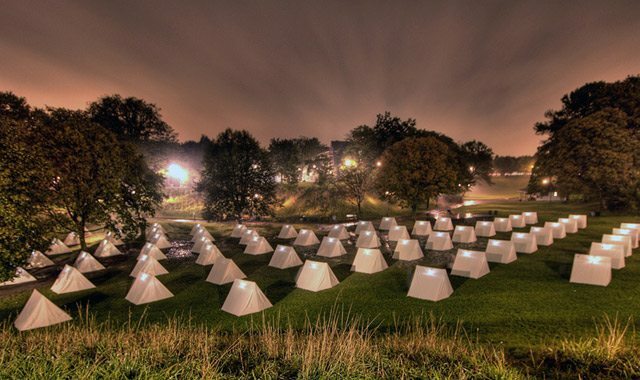 McCowan mentioned a display about a malaria victim—created as part of a previous installation project similar to The Encampment—where visitors discovered, as their eyes adjusted to the lighting, that the tent was covered in mosquito imagery. In the coming weeks, all the participants will figure out what works and what doesn’t, and will provide feedback to one another. After that, the tents will wait for the public to discover the tales within them. CORRECTION: 4:45 PM We originally credited the above Confinement of the Intellect image to Miklos Legrady. The photograph was taken by Ryan Mallard.